Good movie, but totally reflective of how storytelling now works in the age of minimal attention spans. This essay relates to the “arouse and fulfill,” couplet I presented in the second chapter of my book. In today’s world, you gotta arouse real quickly. STARTING WITH A BANG (or a sniffle). 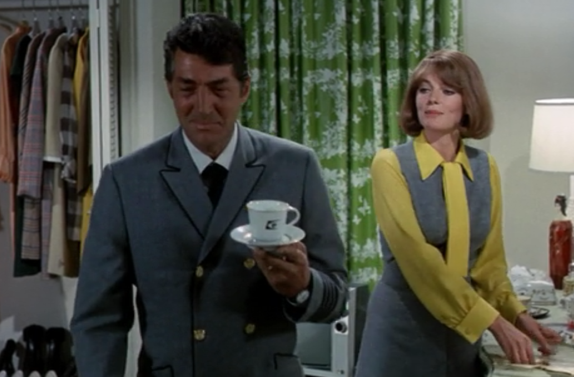 The classic 70’s disaster flick, “Airport” spent the first half of the movie letting you get to know the characters before disaster ensued. By 1995 the crisis movie, “Outbreak,” began the dramatic tension at 23 minutes when Dustin Hoffman discovers a tear in his containment suit. Now, in 2011, the movie “Contagion,” opens with one of the A-level cast, Gwnyeth Paltrow, sick from the very first moment. It’s storytelling for the no attention span era. In the future, ALL stories will begin with an explosion and a dead body. You won’t know who just blew up — we’ll fill you in on that later — what’s important is we get the story going, quick — before you change channels or walk out of the movie theater (as if anyone does that other than for something like “Death to Smoochy,” where a friend showed me it’s actually possible to get a ticket refund after twenty minutes by telling them how much you hate the movie). That’s the pattern we’re going to discuss here. It’s a change in storytelling that is real, and a consequence of our era of information overload. A couple years ago I listened to a panel discussion at Book Expo consisting of several book publishers and literary critics. The last question posed was, “What does the future hold for novels?” One of the publishers said that in the future, novelists will no longer have the luxury of 30 to 40 pages of exposition before they begin their story. Instead, the story will have to begin on page one with the arming of the nuclear weapon, the discovery of a dead body, the news that there’s a bomb on the bus that will detonate if it slows down, or … with the first person coming down with the illness that could end humanity. Which is what I was thinking about in the opening moment of the movie, “Contagion.” There was no set up — no telling us who Gwyneth Paltrow was, no carefree moments of her laughing with her son, tucking him into bed, telling Matt Damon how much she loved him. No, the story began immediately — details to come later … much later. Not that there’s anything wrong with this. In film school we learned about the start of movie making — how D.W. Griffith and other makers of epic movies pronounced that this is a medium which MUST have a great and dramatic story at it’s core which is set up slowly, methodically. But then they were horrified when someone discovered that for most people, all you actually need is a damsel in distress, tied to a railroad track, with a train coming — and presto, your entire audience is riveted by “The Perils of Pauline.” They don’t need to know who the damsel is, how she got there, or even who put her there. They just need that source of tension. Notice the bit about “cause and effect.” That’s what does and doesn’t happen with your emotional state. For you to actually feel something in a movie — something at a deep, visceral, and emotionally memorable level — you need to have the cause established. That’s why stories engage in exposition — to get you invested in characters BEFORE we kill them off, and to give you some understanding of how, if not why, they are dying. Today’s short attention span storytelling doesn’t allow that so much any more. And thus … you just don’t feel as much emotion. Which is the deal with “Contagion.” A solidly made movie, but really mostly kind of melodrama rather than real drama. Now what’s interesting is to look at this long term trend in storytelling. I don’t have time to do a Ph.D. on this, but here’s three fairly reasonably representative data points — three disaster movies over the past four decades. First we have Airport in 1975 — the hugely popular disaster flick (which sowed the seeds for the true masterpiece “Airplane” in 1980 — I got to see a rough cut screening at the Harvard Science Center in 1979 — it changed my life!). It was part of a wave of wonderful disaster flicks in the 70’s that featured all-star casts — this one had Burt Lancaster, Dean Martin, and George Kennedy to name just a few. Then we have “Outbreak” in 1995 starring Dustin Hoffman, Kevin Spacey and Rene Russo. And now “Contagion,” with Gwyneth Paltrow, Matt Damon, Kate Winslett and Jude Law (in a great role as the skeptic). All are fine movies, but each one has a distinctly different story structure which reflects the changes that have been taking place in movie making. With “Airport,” they establish a little bit of tension at the opening with the snowy conditions, but then take lots and lots of time to set up all the various subplots of the plane that’s stuck on the runway, the tension between serious Burt Lancaster and the party boy Dean Martin, plus protestors demonstrating against the noise from the airport (with placards on a snowy night!). 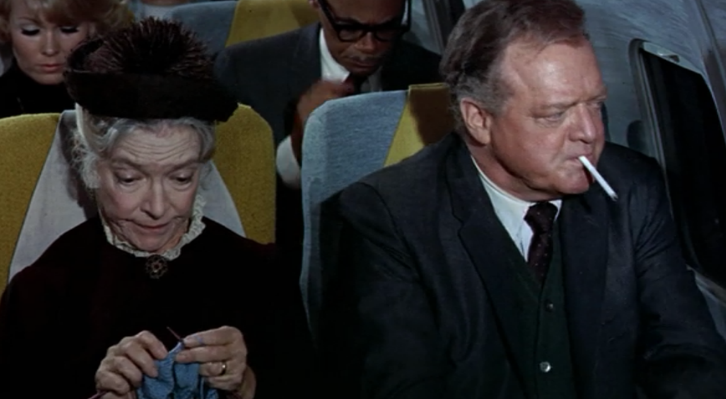 They have lots of fun until finally at 84 minutes the wife of the man who will eventually blow himself up (oops, spoiler, sorry) starts to tell them about the bomb he’s carrying, but then vanishes, and the tension is established — the plane is in jeopardy. Finally. With the movie already half over. With “Outbreak,” a similar bit of initial tension is set up by the African village full of diseased mercenaries which is mysteriously bombed by the officials they thought were going to help them. But then we slip into the same mode of domestic storylines (with Dustin and Rene getting divorced) and kibutzing among the professionals (Kevin Spacey teases Dustin about his divorce). The tension steps up a bit with the need to make a trip to Africa in response to a disease outbreak. But the personal stakes don’t really set up until 23 minutes when Dustin discovers a tear in his containment suit. That’s when the story is finally engaged at a personal level. 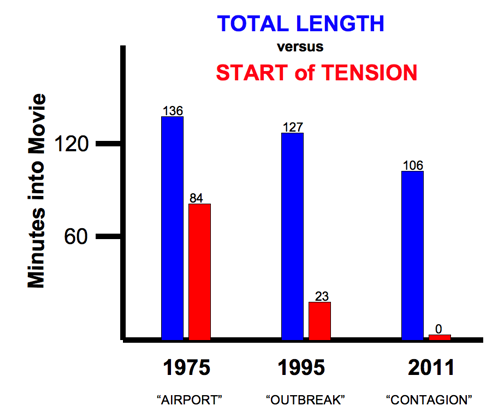 Now jump to the present with “Contagion,” where zero time is wasted. The movie opens with Gwyneth Paltrow on a plane, looking and feeling ill. She’s a star. She’s sick already. There’s no time for fun and kibutzing. The story has already opened with a crisis. Later we’ll find out how she caught this disease. For now, she might as well be Pauline, strapped down on the railroad tracks with the train coming. Same thing we’ve converged on. Storytelling for the digital era. Same thing D.W. Griffiths scoffed at nearly 100 years ago. Plus notice the total length of the movies. Audiences used to be able to sit through more than two hours of disaster. Now it’s down to just over an hour and a half..
Not that there’s anything wrong with it. Just don’t be surprised at the limited shelf life of what’s being made today.